It’s creamy, frosty, vibrant, flavorful, and made entirely out of fruit (with a little mint if you would like an extra splash of cooling refreshment). This berry lemon sorbet is the perfect summertime treat. Enjoy it as an uplifting after-dinner dessert or a cool mid-day snack. It is sweet and creamy enough that even kids will like it! This recipe only requires three ingredients. You’ll just need frozen strawberries, frozen blueberries, and lemon juice. The mix of sweet and tart creates a delicious blend that is pleasing and bright. To elevate the flavor even more, you can optionally include a few mint leaves, adding a refreshing zing. The texture and taste is very similar to a limoncello ice, but you’ll be skipping all of the added sugar and getting a beautiful twist of brightly-colored berries in the mix. The end result is a dish that is as pretty as it is tasty. In addition to giving you a flavorful treat that’s free of added sugar, this recipe also provides the health benefits of blueberries, which have the highest antioxidant count of any common fruit. They have been found to have anti-aging properties, stabilize cholesterol levels, and lower blood pressure. They are a recommended dietary addition because of their ability to ward off heart disease and are often called a “super fruit” because of their many positive health impacts. Berry lemon sorbet could not be easier to make! A blender is the only tool you need get the smooth, creamy consistency you’re after without leaving large chunks of frozen fruit in the middle. (A few small chunks can add to the texture). A blender with a tamper is ideal, but I have some tips below explaining how to make it work without one. Because this calls for frozen berries, you can keep the ingredients on hand and have a go-to sweet treat whenever you are in the mood for a refreshing boost. If you’ll be serving this as a treat to guests, consider garnishing with a fresh strawberry for an extra touch. If you only have fresh fruit on hand, toss it in the freezer overnight before making this sorbet. You need frozen chunks to get the consistency and temperature of a cool, icy summer treat. 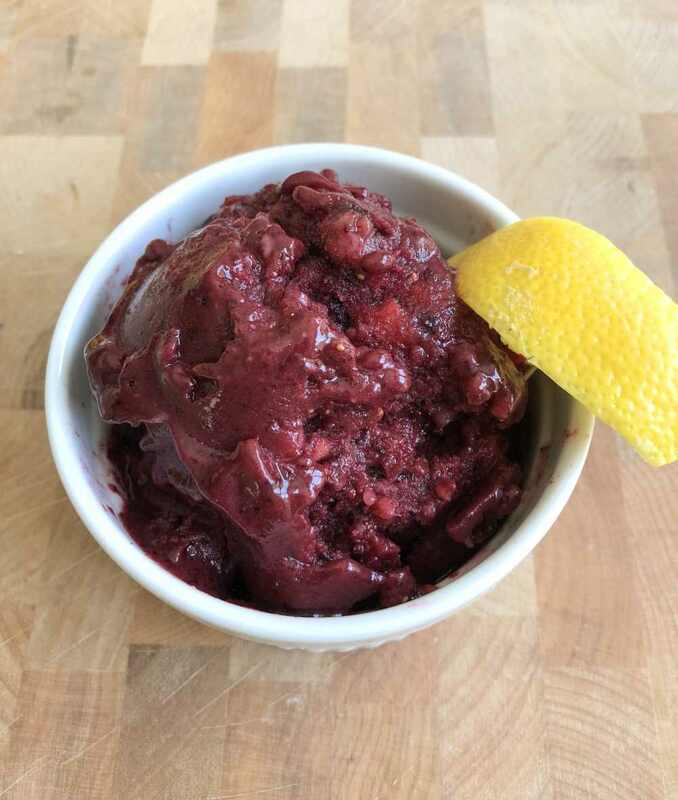 Give this berry lemon sorbet a try to day and brighten your summer with a tasty zing of flavor! · It’s okay to leave a few fruit chunks for extra texture as seen in the picture. · Any of the top blender brands can get the job done just fine, but some work better than others. · Using a basic blender with tamper, like the Vitamix 5300, will ensure that you don’t need any liquid to blend it and will make the process a breeze. If you don’t have one, simply blend, stop and adjust the ingredients until the desired texture is reached. · Consider thawing the fruit a bit if the blades are having an issue pulverizing them fully. · If you have leftover, put them into a popsicle mold to make refreshing popsicles! · Add all ingredients to blender blend. · If you have one, use a tamper to press the berries into the blades. · If you don’t have a tamper, stop blending and adjust ingredients until all the fruit has been processed, but leave a few chunks for extra texture.